If you use herbs in your magical practice at all - and many of us do - a great way to incorporate them into your daily life is to use them in decorative ways around your home. One of the most popular ways to do this is by crafting a simple wreath from your favorite magical herbs. You can customize your wreath based upon your purpose, and hang it on your door or over your altar, or even give it to a friend who might be in need of a magical boost. This is one of the easiest craft projects you can ever make - simply use the wreath frame as a base, and use the florist's wire to anchor the fresh herbs into place. Finish it off with a bit of decorative ribbon, or other magical goodies you may want to add. The more important information here is not how to make the wreath itself - chances are good that you don't need a tutorial for that - but what to put on it. 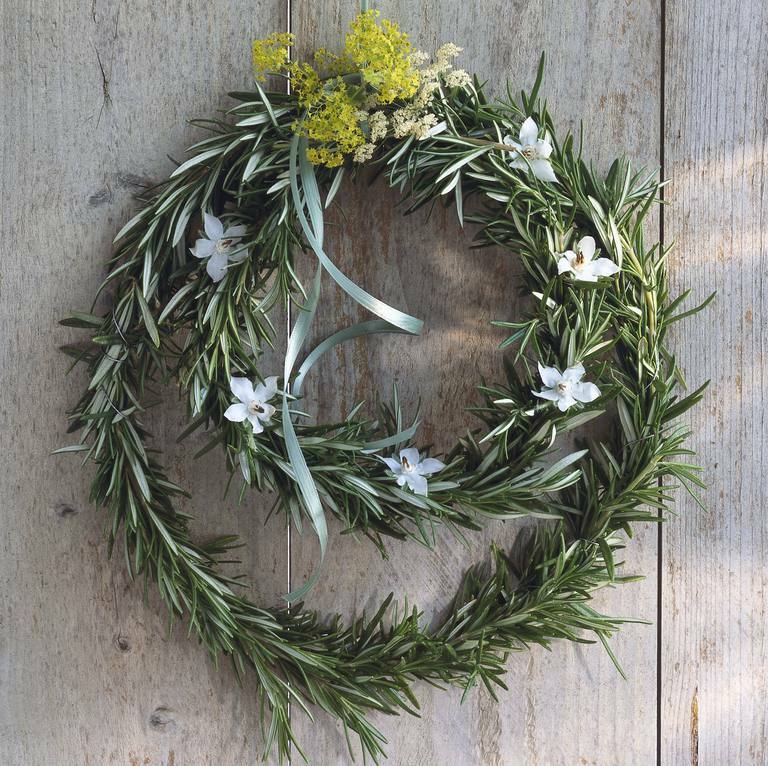 Healing Wreath: Use popular healing herbs like Apple blossom, lavender, barley, comfrey, eucalyptus, fennel, chamomile, goldenseal, borage, feverfew, horehound, lady's mantle, allspice, olive, rosemary, rue, sandalwood, wintergreen, or peppermint. *The wreath in the photo above includes rosemary, borage, and lady's mantle, for healing purposes. Protection Wreath: Hang a protection wreath on your front door, made from some of the following. Aloe vera, hyssop, asoefetida, mandrake, heather, holly, mugwort, onion, wood betony, valerian, sandalwood, snapdragon, fleabane, mustard, garlic, foxglove, dill, mistletoe. Prosperity Wreath: This makes a great gift for friends, as well as something you can make for yourself. Herbs associated with prosperity include bay leaf, basil, chamomile, clover, cinquefoil, tonka bean, Buckeye, myrtle, apple, sunflower, pennyroyal. Tie it up with a green or gold ribbon, for a bit of color magic as well. Love Wreath: What better way to invite love into your home than by hanging a wreath full of love herbs on your door? Use a blend of allspice, apple blossom, bleeding heart, catnip, lavender, periwinkle, peppermint, tulip, violet, daffodil, clove, yarrow, marjoram, basil, fig, valerian, and endive to let the universe know you're ready to welcome love into your life. After your wreath has dried out, you can remove the leaves and store them for future magical use. Be sure to read up on Harvesting, Drying and Storing Your Magical Herbs. Use Chrysanthemums in Your Autumn Magic!